Instead of installing Apache, MySQL, and PHP separately, tasksel offers a convenient way to get a LAMP stack running quickly. Install tasksel if not already installed by default. Use tasksel to install the LAMP stack. Enter the prompt for a MySQL root password. Posted in Administrations, Configurations (Linux). Tagged LAMP, Tasksel, Ubuntu, Ubuntu 16.04. Mailtrain is a self hosted newsletter application built on Node.js (v5+) and MySQL (v5.5+ or MariaDB). Mailtrain supports subscriber list management, list segmentation, custom fields, email templates, large CSV list import files, etc. You can download and run install.sh in your blank Ubuntu VPS to set up. Mailtrain and all required dependencies (including MySQL). The installation script assumes a somewhat blank server, so if this is a machine you are already using for something else, you might want to skip the automatic install and proceed manually. Once authenticated, click on your username in the right top corner of the page and select “Account”. Now you should be able to change your default password. If signed in navigate to http://yourdomain.com/settings and check that all email addresses and domain names are correct. Mailtrain default installation comes bundled with ZoneMTA, so you should be able to send out messages right away. ZoneMTA even handles a lot of bounces (not all kind of bounces though) automatically so you do not have to change anything in the SMTP settings to get going. If you are using the bundled ZoneMTA then you need to add your Mailtrain host to the SPF DNS record of your sending domain. So if you are sending messages as “info@example.com” then the domain “example.com” should have a SPF DNS record that points to the IP address or hostname of your Mailtrain host. Everything should work without the SPF record but setting it up correctly improves the deliverability a lot. If you are using the bundled ZoneMTA then you can provide a DKIM key to sign all outgoing messages. You can provide the DKIM private key in Mailtrain Settings page. This key is only used by ZoneMTA, so if you are using some other provider then you check your providers’ documentation to see how to set up DKIM. In case of ZoneMTA you only need to open Mailtrain Settings page, scroll to DKIM config section and fill the fields for DKIM selector and DKIM private key. Everything should work without the DKIM signatures but setting it up correctly improves the deliverability a lot. The bundled ZoneMTA can already handle a large amount of bounces if you use it to deliver messages but not all – namely such bounces that happen after the recipient MX accepts the message for local delivery. This might happen for example when a user exists, so the MX accepts the message but the quota for that user is checked only when actually storing the message to users’ mailbox. Then a bounce message is generated and sent to the original sender which in your case is the mail address you are sending your list messages from. You can catch these messages and mark such recipients manually as bounced but alternatively you can set up a VERP based bounce handler that does this automatically. In this case the sender on the message envelope would not be your actual address but a rewritten bounce address that points to your Mailtrain installation. To set it up you need to create an additonal DNS MX entry for a bounce domain, eg “bounces.example.com” if you are sending from “example.com”. This entry should point to your Mailtrain server IP address. Next you should enable the VERP handling in Mailtrain Settings page. As ZoneMTA uses envelope sender as the default for DKIM addresses, then if using VERP you need to set up DKIM to your bounce domain instead of sender domain and also store the DKIM key as “bouncedomain.selector.pem” in the ZoneMTA key folder. If you are using the bundled ZoneMTA then you should make sure you are using a proper PTR record for your server. For example if you use DigitalOcean then PTR is set automatically (it’s the droplet name, so make sure your droplet name is the same as the domain name you are running Mailtrain from). If you use AWS then you can request setting up PTR records using this form (requires authentication). Otherwise you would have to check from your service provider, hot to get the PTR record changed. Everything should work without the PTR record but setting it up correctly improves the deliverability a lot. With proper SPF, DKIM and PTR records (DMARC wouldn’t hurt either) I got perfect 10/10 score out from MailTester when sending a campaign message to a MailTester test address. I did not have VERP turned on, so the sender address matched return path address. Posted in Administrations, Configurations (Linux). Tagged Mailtrain, Ubuntu, Ubuntu 16.04. The first step we must do for installing LibreNMS Monitoring Tools is to install some packages needed on the server. Connect to your server and update the repository. Install all the required packages for LibreNMS from the Ubuntu repository using the following command. After the installation is complete, goto the next step. In this tutorial, we will be running LibreNMS under the Nginx web server. Nginx is powerful web server that’s available in the Ubuntu repositories. 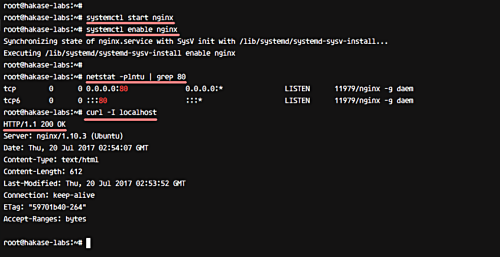 Install nginx using apt command from the repository in the following way. When it’s done, start the service and enable it to run automatically every time at system boot. Nginx web server is running under the default port 80. We can check the port using the netstat command, and check Nginx using curl command to get the HTTP status code, as shown below. Posted in Administrations, Configurations (Linux). Tagged LibreNMS, Ubuntu, Ubuntu 16.04.